It can be hard during the holidays to do something as simple, and as important, as getting outside. Body-cramping travel often eats up full days, and then there's that one day devoted to eating. Other family traditions — watching football, catching up on family news, shopping, arguing politics — can make the holidays entirely indoor events. It can be easy, though, to create outdoor traditions. When I was young, there came a time each Thanksgiving when the cooks pushed everyone else out the door. That was the signal to start our annual touch football game. This was an earlier time, so the teams were comprised mostly of kids and fathers, with a few unattached men joining in. I can still recall the excitement of the huddle, listening to a bright-cheeked dad set out our play, the briskness of the air, and the sharp crinkle of leaves underfoot. When we were allowed back inside to wash up and change for dinner, the sun would be low in the sky and the house warm and filled with the smell of the meal we’d soon sit down to together. Later, when I lived too far from family to travel back home for a short holiday, I celebrated Thanksgiving with friends. Our traditions included charades and a long trail run the day after the holiday. The big family gathering at my father’s in western New York now always ends with a ramble through the neighborhood. The contrast between the warmth of the hearth and the crispness of late November air invigorates us and brings us together in different ways. - Play an outdoor game. Touch or flag football are the classics of this genre. Freeze Tag, Capture the Flag, and Red Rover work well in mixed-age groups. - Take a hike. You don’t have to find a trail. Wander the neighborhood while the turkey is in the oven or walk off the meal in fading light. Take a walk with someone you haven’t had a chance to talk to, or take the kids out for a stroll. - Make a game of observing. Keep young children from getting bored on a walk by challenging them with “I Spy”-style games. Ask them to come up with a plant or animal for every letter of the alphabet. Count words on road signs. Be creative! - Have a leftovers picnic. If you’re lucky enough to have a warm or sunny day, try packing up some leftovers and go to a park or playground for a special “meal out.” Picnic tables may work best for older family members. - Enjoy a moonlight walk. The full moon is on Wednesday, November 25, so if the night of Thanksgiving is clear, you'll enjoy crisp fall air under a beaming moon. 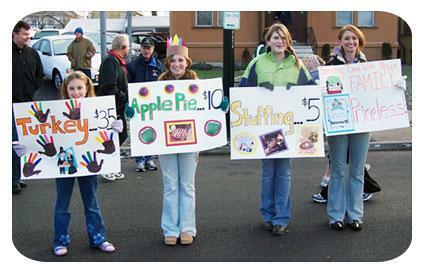 - Sign up for a Turkey Trot. Maybe it’s the alliteration that’s made these Thanksgiving-week road races so common. Some of the “fun runs” have walker categories. Turkey head-gear optional. Find a trot near you by checking out this website. Photo courtesy of the YMCA Buffalo Niagara Turkey Trot.